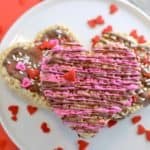 These valentine rice krispie treats are made extra awesome for Valentine’s Day with the heart shape and the addition of chocolate drizzle and sprinkles. So fun! 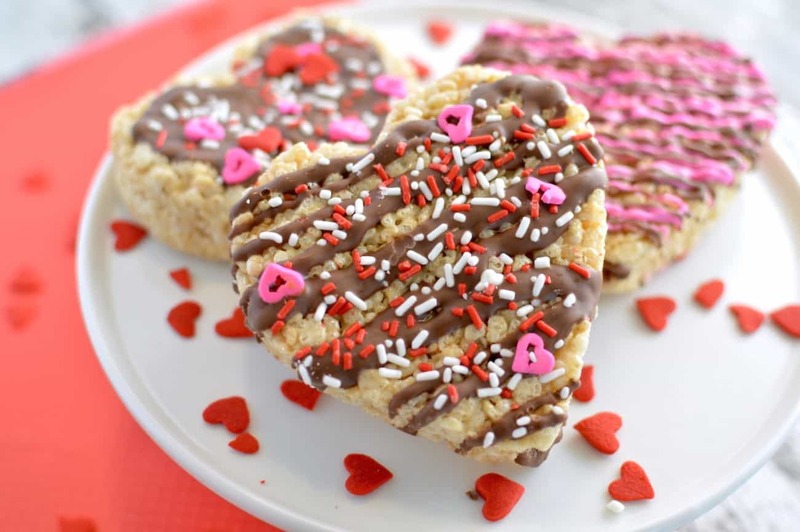 What do you think about heart shaped rice krispie treats? Personally, I’m a huge fan. 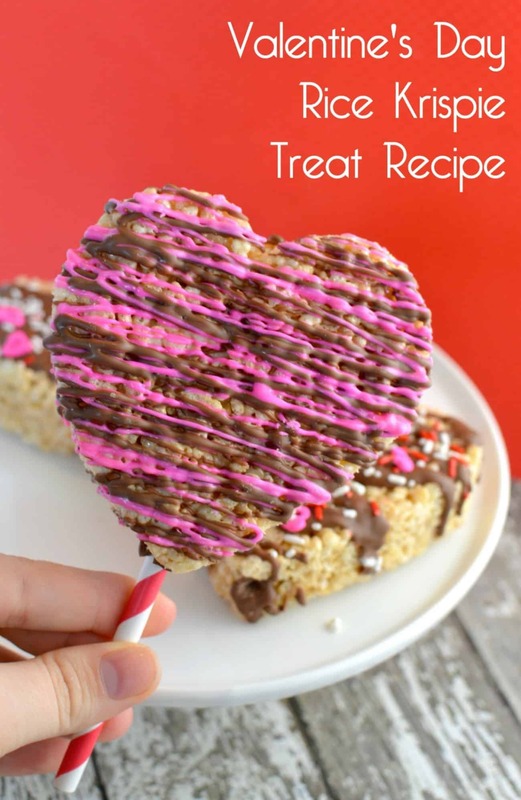 I love a good Rice krispie treat recipe that is ooey, gooey, and delicious. With lots of marshmallow. And if you can make it fun for the holidays, even better, right? 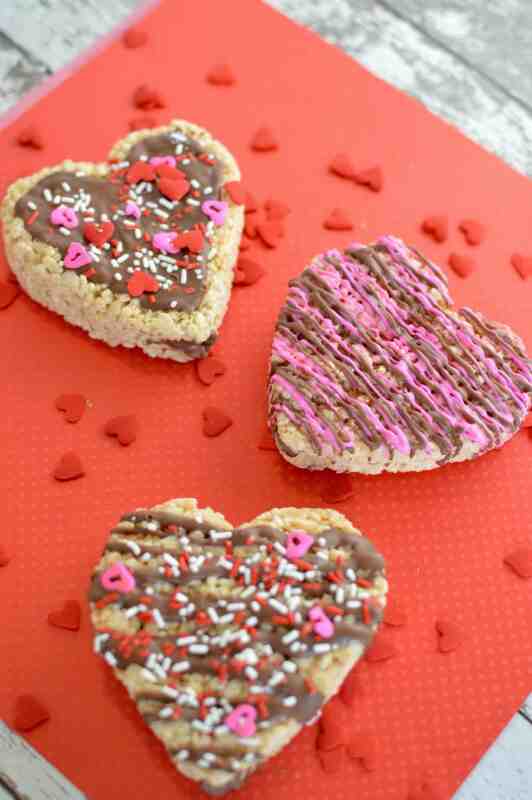 This recipe takes your standard Rice Krispie and makes it really festive for Valentine’s Day! If you’ve never made a Rice Krispie treat before, they are very easy. 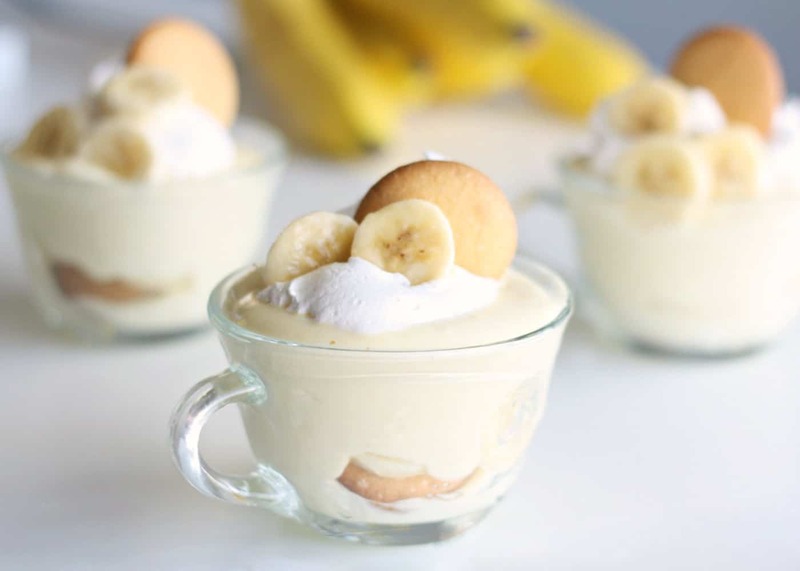 You only need a few ingredients. Get the pan you’ll be using for the finished treats ready to receive sugar-y goodness. Grab a shallow pan and put wax paper on it. Set aside. Place your marshmallows into a pot on the stove set on low heat. Add in your butter and let warm and stir around until melted. Mix in your crispy rice cereal. Stir until evenly coated. Once completely combined, pour the mixture into your prepared pan with wax paper. Spread out with the spatula to cover the entire pan and flatten (about 1″ thick). Place in fridge for an hour to cool and harden. Take the pan out of the fridge and remove the rice krispie treats (but leave the wax paper underneath). Grab your cookie cutter and cut as many hearts as you’re able to. Decorate the hearts by melting any candy melts according to package instructions. Either spoon on the melted candy melts or drizzle it on with a spoon. Immediately sprinkle the sprinkles onto the melted candy melts while still soft. 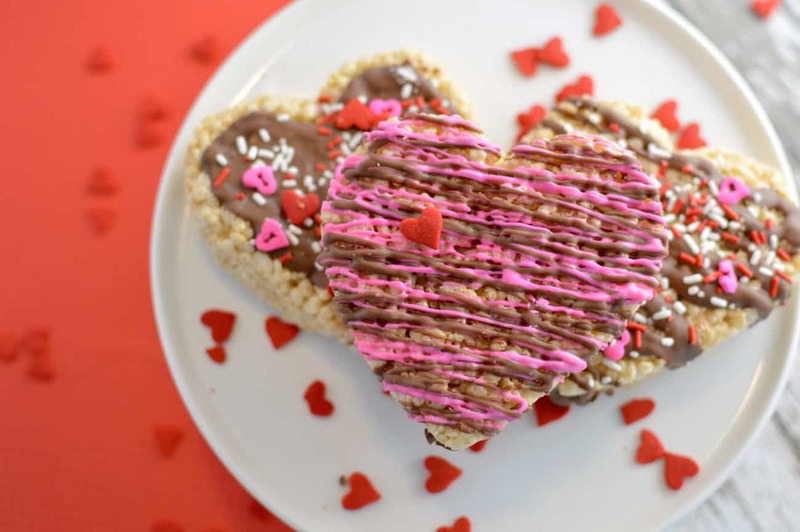 These valentine rice krispie treats are made extra awesome for Valentine's Day with the heart shape and the addition of chocolate drizzle and sprinkles. So fun! Get the pan you'll be using for the finished treats ready to receive sugar-y goodness. Grab a shallow pan and put wax paper on it. Set aside. Once completely combined, pour the mixture into your prepared pan with wax paper. Spread out with the spatula to cover the entire pan and flatten (about 1" thick). Take the pan out of the fridge and remove the rice krispie treats (but leave the wax paper underneath). Grab your cookie cutter and cut as many hearts as you're able to. 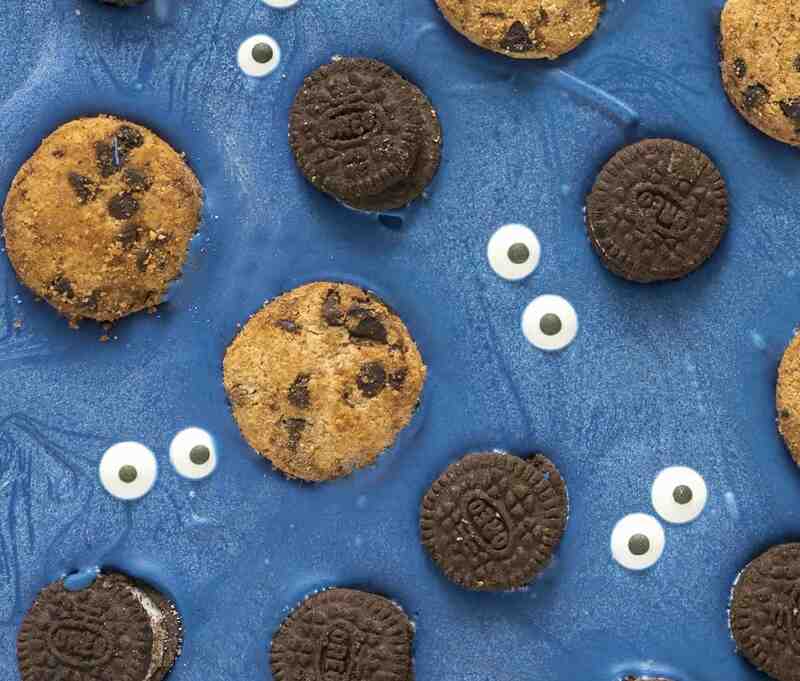 You may get more or less of these treats depending on the size of your heart cookie cutter. If so, you'll need to adjust nutritional information accordingly. 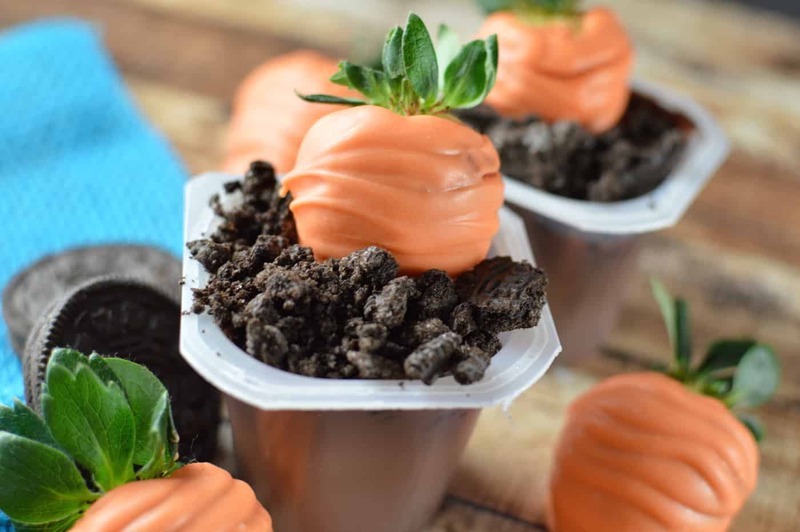 The cocoa and candy melt drizzle adds a little something special to the treats. Aren’t they darling? 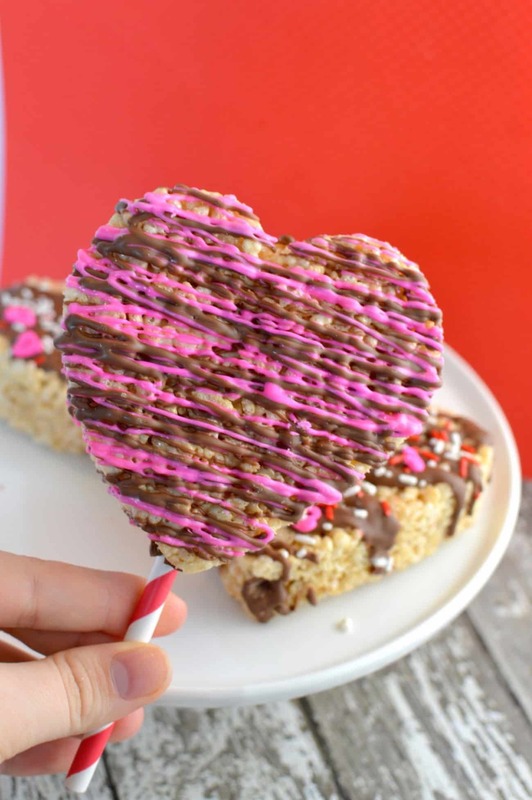 And of course if you want to make them even more amazing, stick a paper straw into the base of the heart, turning them into Valentine’s Day Rice Krispie Treat pops. They make great gifts! 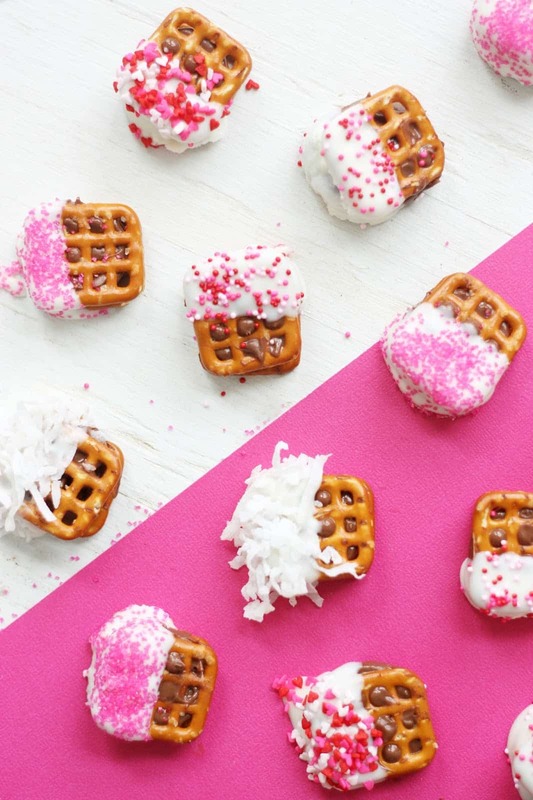 These rice krispie treats look so cute and delicious! I love them!